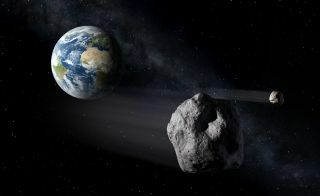 An artist's illustration of asteroids, or near-Earth objects, that highlight the need for a complete Space Situational Awareness system. Now you can join the hunt for potentially hazardous — or incredibly valuable — asteroids. The asteroid-mining firm Planetary Resources and citizen-science site Zooniverse have teamed up to launch Asteroid Zoo, a Web-based project that asks people around the world to scour image archives for undiscovered space rocks that zoom close to Earth. The project aims to help researchers find asteroids that may pose a risk to the planet down the road, as well as space rocks that may be good mining targets, organizers said. "With Asteroid Zoo, we hope to extend the effort to discover asteroids beyond astronomers and harness the wisdom of crowds to provide a real benefit to Earth," Planetary Resources president and chief engineer Chris Lewicki said in a statement. Asteroid Zoo users will search through photos taken by the Catalina Sky Survey, an Arizona-based observing effort that has discovered nearly half of the roughly 11,000 near-Earth asteroids astronomers have identified to date. While this sounds like hard work, the project turns the asteroid hunt into a game that users can play on their computers or mobile devices, organizers said. And the results could have long-term scientific benefits, helping streamline and automate the search for space rocks. "In the future, we hope to use the classifications provided by volunteers to improve automated searching and suggest new methods by which machines might take up the strain," Zooniverse principal investigator Chris Lintott, an astronomer at Oxford University in England, said in a statement. Scientists think millions of asteroids cruise through space in Earth's neighborhood, the vast majority of which have yet to be found and tracked. For example, researchers estimate that less than 1 percent of near-Earth asteroids that are at least 100 feet (30 meters) wide — which could cause major damage if they hit a city — have been identified to date. Zooniverse hosts more than 25 citizen-science projects, in fields ranging from biology to astronomy. Zooniverse traces its roots to the 2007 launch of Galaxy Zoo, which asks users to classify galaxies by their shapes. To learn more about Asteroid Zoo, visit http://www.asteroidzoo.org.